Last Thursday while driving to an appointment just before noon, I was positively enthralled with the bright winter sunshine and crisp temperatures. As I drove through the countryside nearing midday, I noticed the angle of the sun gaining ever so slightly higher in the sky. What a great and positive feeling I experienced as I thought about the coming spring and all the activities that we would be undertaking on our farm. It has already begun, making spreadsheets for planning the pastured poultry production schedules, building new processing equipment, purchasing supplies. Building a new brooder, building three new chicken tractors are some of the projects we will complete. We have burned through two cords of wood and have one remaining. Hopefully our oil tank has been filled for the last time this year but the propane will require one more visit from our local propane provider. The sun now streams into the family room at the perfect angle to prevent the room from getting too cold. Our project this weekend was building our seed starting area in the new greenhouse. 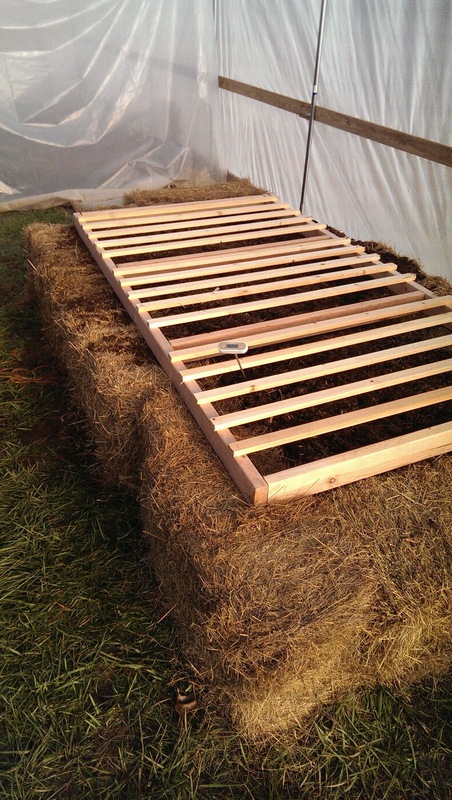 We built a holding type area out of older unused hay bales and filled the interior with fresh horse manure. We constructed a crude 2” x 4” frame and tacked some furring strips onto it. This will be the table where the seeds trays and soil blocks will have the warmth to germinate our first seeds this week. The top is covered with PVC hoops and plastic sheeting to retain heat. This was a great idea that I saw on a YouTube video of the Muddy Fingers Farm in New York. It saves money on electricity and reduces our environmental footprint in the process. Seed starting area built from hay and fresh horse manure in greenhouse. Another important project that is coming up as soon as the weather breaks, is the completion of the water line from the surface well to a pressure tank in the greenhouse. We will also need to run supply lines to the two main growing areas. Time and money is what I always say. Excitement abounds about the work will be doing. Check back soon as we post our successes and show you how and where great food comes from.